Learning something new every day is a good thing -- it keeps my mind fresh and pushes the boundaries of my world just a little bit further. Accepting help doesn't make me less of a wife or a mom or a person -- it just makes me human. I was 18 years old and about to leave for college when I told my dad that his job as a parent was done. It was July, it was hot, and he was lecturing me, trying to impart what I viewed as last-minute life lessons before I flew the coop. I was dressed for the pool, late to meet my friends, and not interested in his advice. To me, back then, it was simple: I wanted to be treated like a grown-up, not a child (though in retrospect I'd done little other than reaching the legal age of maturity to earn the mantle). And so I interrupted him, telling him that I was an adult, that his time for parenting had passed, that he had taught me what he could and the learning process was over. In the nearly 13 years since that conversation, life has repeatedly reminded me how wrong I was. As it turns out, age doesn't equal wisdom. Arbitrarily turning 18 meant only that I could purchase lottery tickets (I didn't play), cigarettes (I didn't smoke), and vote (I knew shockingly little about politics). Turning 21 meant simply that I could ditch my fake ID and suddenly show the real one at bars (hypothetically, of course). And even as I grew older and hit other milestones -- as I graduated from college, then law school, as I got married, started my career, had children -- I didn't suddenly become an adult with all the answers. If anything, "growing up" and becoming a mom has taught me how little I really know. How much I need others to help me along the way. How opportunities to learn and grow are everywhere, if only I'm open to them. 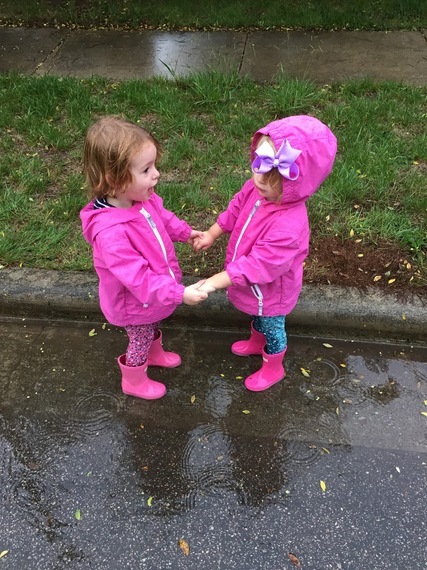 But it's not always so easy to be open, to admit that I don't know what I'm doing, that I need help or advice or guidance -- especially when two little girls think their mama knows everything. It's harder to be vulnerable than it is to fake confidence. To admit weakness, instead of pretending to be strong. To let myself accept help, advice, suggestions, and learn. I've realized, though, that stubbornness won't get me anywhere. Learning something new every day is a good thing -- it keeps my mind fresh and pushes the boundaries of my world just a little bit further. Accepting help doesn't make me less of a wife or a mom or a person -- it just makes me human. And so when I complain to my dad that it's pouring outside and we're cooped up in the house and he tells me to put on some rain boots and jackets and head outside to splash in puddles, I take his advice. I do it. I deal with the struggle to get everyone dressed and the mental hurdle of all that wet laundry and I listen to my dad. And I watch the girls jump around in the rain and get soaked and muddy. I see them making memories. 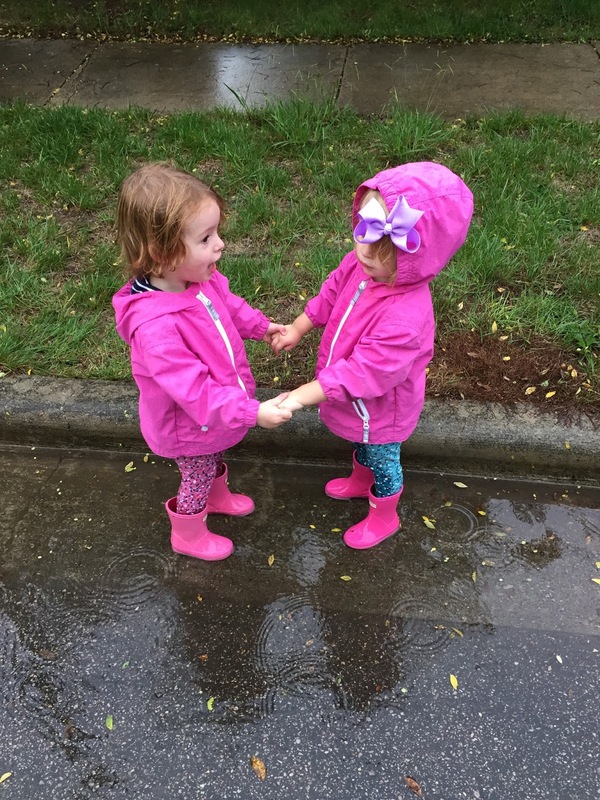 That time mom took us outside when it was raining and we got to jump in the huge puddles! I let strangers hold multiple doors open in a row when I'm managing the double stroller, instead of saying, "Oh, it's fine, I've got it," while earning painful bruises trying to do it on my own. I say yes sometimes when the girls are cranky and hungry and over grocery shopping and the cashier at Harris Teeter asks if he can help me out to my car. There are no bonus points for showing how tough I can make things on myself. I listen to my daughter, Emma, when she drops her open cup of water, again (after I've warned her, several times, to be careful and hold it upright), when she says, "Mom, I sorry. It's just a little water, it's wet. It get dry." She is right and she is trying. She will never learn if I don't let her make some mistakes. I hear her twin, Charlotte, respond when I tell her she is smart or beautiful or funny. "Thank you, Mommy," she says, with a huge smile. She accepts the compliment for what it is and at this young age, she believes in herself. She has never said "Oh, stop," or "No, I'm not," or "You're just being nice." If only she can hold on to that. Not everyone around me will always be right. Sometimes I do know best. But sometimes I don't. And I'm figuring out that wisdom comes from knowing the difference -- knowing when to ask for help, when to admit defeat, when to listen when I feel like talking. I'm trying, hard, to learn that lesson, to walk the line between following my heart and listening to others, to figure out whose voice to trust and when and why. To get to where my dad was all those years ago, when he stayed quiet after my know-it-all outburst: the place where he knew better, and knew that telling me he did wouldn't matter. Knew that my teacher would be experience in the form of trial and error and success and failure, in the form of my small children humbling me with their innocent and on-point observations about the world around them. Knew that my learning process was really just beginning.